As another season is ready to commence, now is the time to solidify plans and details, and be sure that you are able to work through the grind of the season in the smartest way possible. Utilizing technology to help you and your staff be efficient will pay dividends in both preparation for each week as well as alleviating some of the stress that comes with the long work day that the season brings. In 2010, huge advancements improved the way we are able to work as coaches. The film room became mobile. Players and coaches could watch film on their computers from anywhere, and the mobile applications allowing viewing from smart phones and tablets followed. The model we used to work in was built around the viewing device. First it was reel to reel 8mm. The term cut-ups came from the process of actually manually cutting the film strip and splicing it together with other plays. Then linear systems overtook the process with various VHS formats. Digital systems allowed us to work non-linearly with the ease of filtering clips into our different cut-up lists. We seem slow to move from our old ways. We still anchor ourselves to the film room even though we don’t physically have to be in a particular place to do our work. We need to rethink the process and cut ourselves from the office at times. It keeps us fresh mentally and allows a little more face time with the family. Utilizing both our existing web based video systems and other software programs, we can turn the process of practice planning, game preparation, and even coaching and interacting with our players to a much more effective and efficient process. Game preparation and game planning require a great level of detail to ensure that you are taking all the insight gained through film breakdown and tendency reports and turning it into an executable plan. The process results in two documents that must be prepared for each practice, the practice plan, and the script. Practice Planner Live (www.practiceplannerlive.com) provides a way to not only prepare practice, but to look at and analyze how time is being used. Knowing what problems you might be experiencing in a certain phase of the game, you can easily go back and see how much practice time has been devoted. This understanding can help coaches to adjust both drills as well as time to help improve in a designated area. Practice Planner Live allows the coach to put together individual, group, and team periods as well as assigning drills to each period. Once the information is entered, it’s just a drop down menu that allows a coach to point and click to quickly fill out the practice plan. The scripting portion of practice can become very time consuming for the staff. Knowing how many reps a play is receiving over the course of the week, being sure it is run in the proper situations, and preparing for all group and team period can take up to two hours a day depending on the detail the coach wants. The Coaches Edge Game Planning System sold by American Football Monthly takes out all of the tedious work. Once plays are entered into the game plan, not only are the scripts generated for each practice, the call sheets are as well.The coach can enter defensive calls as well. This saves up to 10 hours per week. Camp installation scripts can be generated easily. The same process is used. Enter the plays you are installing and your script will be generated. 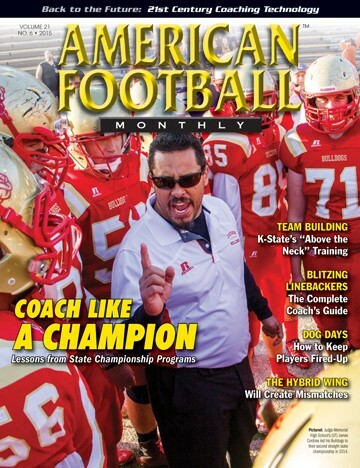 More information as well as video overview is available at www.americanfootballmonthly.com. Many coaches like to utilize scout cards for their scout teams on both offense and defense. Football Play Card (www.footballplaycard.com) allows a coach to cut the time required to just a fraction of hand drawing cards. Because it’s web based, the coach does not need to be in the office to do his work. In just minutes, the cards for the practice can be drawn and ready to go. The cards can be sent to an iPad if saving money on printing costs is desirable. The system is user friendly. Just Play Solutions provides a great alternative for teaching a system. It keeps all of the diagrams, supporting documentation like Power Point, PDF, or Word Documents as well as video in one place. Just Play Solutions has a real “social” feel to it. It allows one to one interaction between a player and a coach, as well as allowing a coach to instantaneously send game plans, adjustments and coaching points to a player or group of players. It includes a testing function to be sure all players have the understanding necessary to be successful when they hit the field. The flow through the content is user friendly and replaces the old paper playbook with a much more powerful teaching and learning tool. This software is being adopted by many big college programs. This allows a player to view it securely from his device. Access can be managed easily by the coach. It is a very affordable solution to what just a year or two ago was only available to the pros and top college programs. This is worth checking out. Go Rout provides one of the most innovative processes for play review and immediate feedback after a play through their patent pending “See It. Do It. Review It” process. Through the use of a military grade monitor about the size of a smart phone in what looks like a wristband attached to the players belt, the player can view the diagram of the play and coaching points right on the field before his rep. Immediately following the play the player can look at his monitor and view his performance. It is real time practice technology that allows for corrections to be made right on the field and not a couple of hours later in the film room. Additionally, the coach can make a decision to adjust a play on the field and immediately it is sent to each players device. The application of this technology also allows for the scout team to quickly see their information. Is your defense facing an up-tempo, no-huddle team? Now the scout offense can quickly align and see the play they are running on their device. Finally, preparing all players with the proper reps is definitely a challenge. Many times there is only time to prepare the starters and key back-ups. EON Sports Virtual Reality (www.eonsprtsvr.com) provides the solution to that problem. Their virtual reality simulators allow a player to mentally be in the play. He can turn his head, see his keys, understand how players moving in front of him determine his reaction. While the muscle memory is not developed, the movement recognition is. Whether it’s a quarterback working on his read progression, an offensive lineman seeing a stint, or a linebacker reading his keys to better understand his run fit or pass drop, this technology allows those mental reps to be executed in a fraction of the time it takes on the field. This is a tool that can be used in many ways to prepare your team.